What is CMMI Maturity Level 3? CMMI standard for capability maturity model is a proven approach to performance management with decades of results showing that it works. Organizations having CMMI certification have predictable cost, schedule, effectiveness and quality business results that serve as discriminators among their competitors. CMMI can be appraised using two different approaches: staged and continuous. The staged approach yields appraisal results as one of five maturity levels. The continuous approach yields one of four capability levels. The differences in these approaches are felt only in the appraisal; the best practices are equivalent and result in equivalent process improvement results. We are a leading documents selling company that offers readymade system documentation and training presentation kits for various certification and management systems. We have global clients in more than 65 countries. The CMMI Maturity Level 3 Documents (Dev) are globally used documents available with simple modification features and compatible with clause-wise requirements of CMMI maturity models for software development companies. The CMMI Level 3 Documentation Kit includes CMMI manual, quality policy, CMMI process documents, mandatory procedures, instruction guide, coding standards, set of sample templates and formats, audit checklists and affirmation questions. The manual, procedures and sample templates are important documents, which can be used as ready-to-use tool and assist in swift documentation process for CMMI certification of Level 3 for software development companies. The documents given are already used and verified for designing and developing CMMI maturity model in various software/IT organizations by our expert CMM consulting team. The entire documentation kit is based on CMMI Maturity Level 3, which assists users to understand development of CMMI Level 3 and how to achieve fast and effective system certification. We assure that our packages are competitively priced and completely meet the demands of the new CMMI Level 3 requirements for development companies. 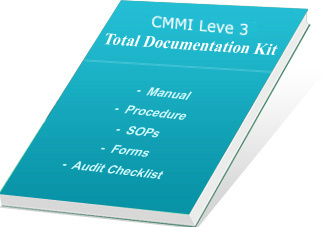 What Does CMMI Level 3 (Dev) Total Documentation Kit offer? This manual covers the policies and guidelines for all the 18 process areas of CMMI level 3, guidelines to implement the policy, measurement objectives and organization chart. This document is having process flow chart for micro-level activity details for the life-cycle model. It includes documents for all key processes to establish and standardize the processes. It includes total 35 mandatory CMMI procedures for effective implementation of quality management system in four main areas of engineering, organization process management, project management and Support Activities. The guideline documents help the company to standardize and establish the system. CMMI coding standard includes the programming guidelines as well as good software development standards (total 8) to establish system and discipline in the development team. The sample CMMI templates cover organizational and projects related all forms and are to be used in various work areas such as business development, software development, planning, organization process group, QA, quality control, etc., and helps the organization to build a good system. QA audit checklist includes a set of questionnaire of more than 400 audit checklists as per CMMI Level 3 maturity model for development, which can be customized to prepare own internal auditing checklist. List of Affirmation questions helps organizations to ensure that the concerned employees understand the processes and are well-aware to implement the system as per CMMI QMS established in the company. You can purchase any single or the entire set of documents with prices listed above by clicking button available along with that document. We offer 40% Discount on total CMMI Level 3 documentation package. CMMI Level 3 documentation kit is now available at Just 999USD. CMMI Maturity Level 3 Certification Total Documentation Kit covers sample copy of CMMI Level 3 manual and policy which help to study and analyze CMMI maturity levels. The kit helps in defining the baseline system that satisfies CMMI requirements as well as covers development model principles. The total documentation covers sample copy of mandatory procedures covering all the details like purpose, scope, responsibility, how procedure is followed as well as list of exhibits, reference documents and formats. The entire CMMI documentation Kit is available in editable format so it is very easy to edit and create total documents as per your organizational requirement. The documents are well-written in simple English and are compatible with Windows 1997 or its higher versions. Following are the key benefits of using our CMMI standard documentation kit for CMMI Level 3 certification. CMMI Maturity Level 3 Documentation Kit is ideal for organizations and individuals learning the implementation of CMMI to ensure successful implementation of Level 3 for development model. Procedures and formats provided in the document are used to integrate software engineering and management teams to make their personnel more effective and efficient and take good performance measures. Saves much time and cost in document preparation for CMMI Maturity Level 3. Ready-to-use templates can be edited as per organization’s products and anyone can create own CMM Level 3 documents with minimum efforts. The kit contains CMMI manual, procedures, templates and formats that comply with CMMI process area’s requirements. The complete set of CMMI documents defines the baseline system that satisfies CMMI requirements. On successful completion of secured purchase of any CMMI level 3 products, we provide username and password to download the same from our FTP server. We provide instant online delivery of our products as soon as we receive confirmation from paypal.com. CMMI Level 3 Documentation Kit is available at a very compatible price and anyone can purchase it by secure online transaction via Paypal.com. We provide E-delivery of our products worldwide. Our products are used in more than 65 countries.